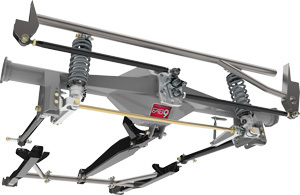 Chassisworks' Torque Arm g-Link Suspension brings superior pro-touring handling performance to nearly any vehicles. Innovative design and careful engineering helped to create a modular component system that adapts easily to OEM or custom frame rails. A pair of flanged adjusters, when rotated, shift the rear section of the arm between the mounting tabs and aligns the position of the front pivot to chassis mount. Serrated tabs, welded to the housing, and matching washers interlock when tightened and allow incremental adjustment of the pinion angle. A complete 4x2" rear frame with suspension. This is the best option for high horsepower builds that are beyond what can be safely done with a factory chassis. Also available as full-frame. For fitment onto your OEM or custom built frame. The custom-fit torque arm suspension is available with various length control arms, torque arms, and housing widths to best fit your vehicle. Options are listed in the sales selector. Popular mainstream vehicles benefit from having a selection of components available to compliment the torque arm system, such as multiple control arm styles or chassis stiffening systems.